If you cannot find a Puppy School close to where you live, or you want to find a training class for an older dog, you will need to do some research to find the best one. The worst thing to do is call a number from the first advert you see, sign up and hope for the best! If you ask enough people, you will end up with a list of all the local classes as well as some idea of their quality. 2. 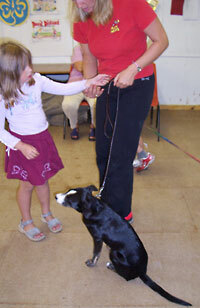 Contact the trainer you think may be suitable and and ask to visit all of the classes WITHOUT YOUR DOG. It is very important to visit without your dog so that you can make an objective assessment without being distracted or being asked to join in. Positive training methods for training puppies/dogs and humans, using praise, food treats and games with toys. Training is effective for both people and puppies/dogs so that all are learning and progressing. Any off-lead play is carefully managed and supervised with just a few puppies off lead for short periods of time. People and puppies/dogs are having fun. Puppies and adult dogs are in separate classes. Puppies under 20 weeks are kept separate from adult dogs. Small class sizes (8 puppies/dogs maximum per trainer/assistant). No check chains, prong collars or electric collars. No rough treatment of, grabbing, shaking, shouting at puppies or dogs or pinning them to the floor. No spraying with water pistols/air sprays. No throwing of noise makers. No humiliation or shaming of owners. 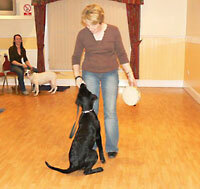 Ask yourself ‘would my puppy/dog and I look forward to coming to this class’? 3. Enrol in the one you think is most suitable, even if you have to wait for a while to get a place on a course or have to travel a distance to get to it – it will be worth it!